NEW YORK - The city of New York is largely considered the top terror target in America and an explosion in the city’s Chelsea neighborhood Saturday evening immediately set off fears another attack. The concerns were heightened in part because officials found a second suspicious device nearby, and hours earlier a pipe bomb exploded next to a charity race a few miles away at the Jersey Shore. De Blasio said the Chelsea explosion had no terrorist connection and wasn’t related to a pipe bomb explosion earlier Saturday in Seaside Park, New Jersey, that forced the cancellation of a charity run. At a press conference Sunday morning, New York Governor Andrew Cuomo said he had spoken with New Jersey Governor Chris Christie, and so far the explosives did not appear to be similar. He noted that 1,000 additional law enforcement officers were being deployed after the Saturday night blast in Chelsea, a primarily residential neighborhood on Manhattan’s west side that’s known for its art galleries and large gay population. He encouraged New Yorkers to go about their day as usual. 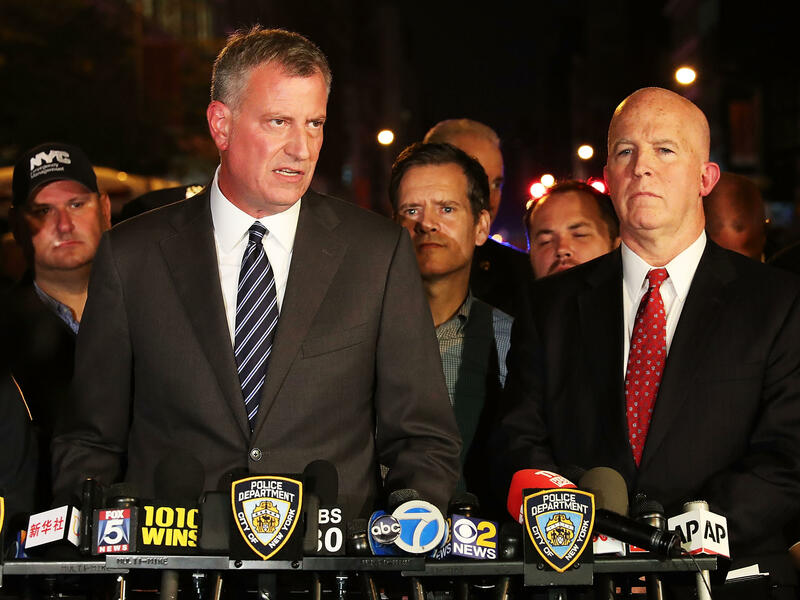 It was unclear who was behind the blasts in New York and New Jersey, and what motivated them. A law enforcement source tells CBS News senior investigative producer Pat Milton that while no suspect nor motive has been established, terrorism has not definitively been ruled out as a possibility. Fire Commissioner Daniel Nigro said a total of 29 people were injured in the Chelsea blast. He said one person’s injuries were serious and the rest were minor. No one was injured in the explosion in Seaside Park. Despite de Blasio’s attempt to calm the public, law enforcement sources told CBS News the Joint Terrorism Task Force is ramping up operations in New York. The second device that officers investigated four blocks from the Chelsea scene was a pressure cooker with a cellphone and wires attached, and was found in a plastic bag. The device was found inside a plastic bag on West 27th Street. The device was removed with a robot and taken to a department firing range in the Bronx. The New York Times reports the second device appeared to be similar to the devices used in the Boston Marathon bombing. The explosion that rocked a bustling Chelsea neighborhood appeared to have come from a construction toolbox in front of a building. Photos from the scene show a twisted and crumpled black metal box. “This is a very dense area, the whole block is restaurants and residences and this area on a warm Saturday night is an area swarming with people,” New York City Councilman Cory Johnson told CBS New York. The blast happened on West 23rd Street, in front of a residence for the blind, near a major thoroughfare with many restaurants and a Trader Joe’s supermarket. Witnesses said the explosion at about 8:30 p.m. blew out the windows of businesses and scattered debris in the area. Officials said no evacuations were necessary. Nigro said several people were taken to hospitals with injuries. One person received a puncture wound that was considered serious. The other injuries were described as scrapes and bruises. New York City subway routes were affected by the explosion, which rattled some New Yorkers and visitors on the heels of the 15th anniversary of the 9/11 terror attacks. Chris Gonzalez, visiting from Dallas, was having dinner with friends at a restaurant in the area. Rudy Alcide, a bouncer at Vanity Nightclub at 21st Street and 6th Avenue, said he, at first, thought something large had fallen. The FBI and Homeland Security officials, along with the Bureau of Alcohol, Tobacco, Firearms and Explosives arson and explosive task force, were at the scene. The White House said President Barack Obama was apprised of the explosion. In St. Cloud, Minnesota, police said at least eight peoplewere injured at a shopping mall Saturday evening in a stabbing attack. The suspect was shot dead by an off-duty police officer. “We have to let this investigation unfold,” she said. Donald Trump moved ahead of New York City officials when he declared a “bomb went off” in the city before officials had released details. He made the announcement minutes after stepping off his plane during a rally at an airport hangar in Colorado Springs, Colorado. “I must tell you that just before I got off the plane a bomb went off in New York and nobody knows what’s going on,” Trump said. The Republican presidential nominee made the comments around 9:10 p.m., shortly after the explosion and as emergency officials responded to the blast. A spokeswoman for Trump did not respond to an email asking whether he was briefed about it before taking the stage. The Manhattan blast came hours after a pipe bomb exploded in Seaside Park, New Jersey, shortly before thousands of runners were due to participate in a charity 5K race to benefit Marines and sailors. The run was canceled, and no injuries were reported.